Tim Obert, the co-founder of Second Cask Coffee , is a man of passion, big ideas, and putting those ideas into action. You see, Second Cask Coffee was born just a few short months ago. However, the idea to age green coffee beans in old barrels of whiskey, wine, and beer before roasting them has been brewing with Tim for quite some time. In 2013, Tim and his business partner and college friend, Clint Potter, established the successful Seven Stills Distillery in San Francisco, California. The focus of their distillery is the use of local craft beers and distilling them into small-batch whiskeys, vodkas, and bitters. Over the past several years, as Seven Stills continued to grow and explore new avenues for the distillery and beyond, it was time to move to a larger location to accommodate those growing needs. Some of those ideas came to fruition upon move-in day. Their new neighbor, Walter, came to welcome Tim and Clint to the neighborhood and brought samples of his company’s product. As luck would have it, that product was Artis coffee . As Tim put it, “Meeting Walter that day, who happens to be a coffee bean sourcer and roaster for Artis, was kismet,” which led Tim and a silent partner to officially dive into the coffee market. Second Cask Coffee, although a separate venture from the distillery, uses leftover whiskey, wine, and beer barrels from Seven Stills to age green coffee beans for one to four weeks. Green coffee beans pick up the “rich whiskey and oak characteristics” before the beans are roasted. “There are are a few other people doing this but Second Cask is excited to bring in a variety of experimental stuff” to their consumers, Tim said. 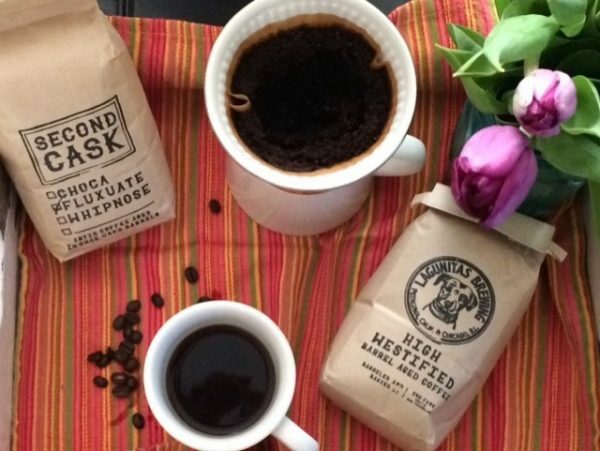 In this project phase, the plan is to experiment with aging coffee beans in a variety of barrels, test out bold flavors, and push the envelope in this market. 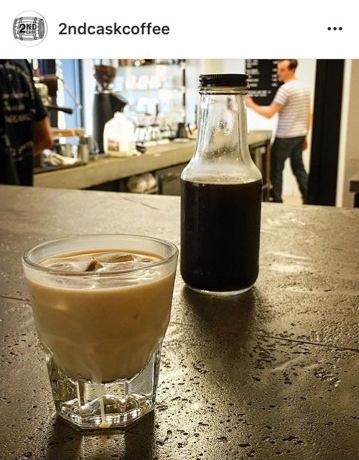 In fact, cold brew using a barrel-aged coffee bean is in store next, and they anticipate having both limited edition batches and cold brew on tap at the distillery – road trip, anyone? Tim says that Second Cask wants to “keep everything as ridiculous as possible, keep it fun, and to always move in exciting directions.” These guys are well on their way to fulfilling that wish. Tim sent two types of beans to try: the Lagunitas High Westfield blend and Fluxuate. 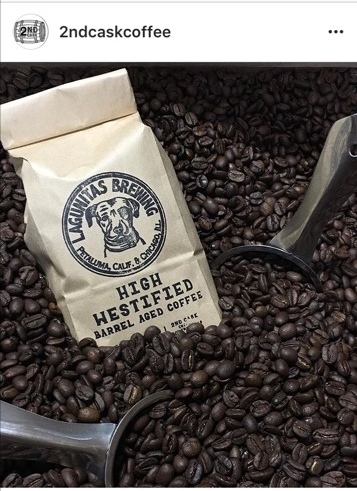 The Lagunitas High Westfield blend was the first batch of beans aged by Second Cask. The beans were aged in a barrel with Lagunitas Cappuccino Stout and High Westfield Whiskey. When you open the adorable craft paper packaging with the Lagunitas Brewing Company logo and get a whiff of the beans, you instantly want to grab some dark chocolate and brew a cup. The beans smell just as the coffee tastes – bold, sweet and slightly boozy. I used a pour-over method to capture the full experience of the coffee, and again, the warm flavors truly come out with each sip. Hints of cappuccino, chocolate, and a smooth, delicious whiskey come through. When paired with a piece of dark chocolate, it was a figurative flavor explosion in my mouth, and all I could think was that I had met one of my new favorite dessert coffees, one that I could sip while wrapped in a fuzzy blanket and feel like all is right in the world. Next up, was the Fluxuate blend. This blend smells incredible – the aroma is rich and bold, with an intense vanilla sweetness from the whiskey. The whiskey is distilled from a coffee porter with Flux Cold Brewed Coffee – how cool is that?! I brewed this coffee using the pour-over method and, again, the taste was on point with the aroma of the beans. It goes down very smooth but the rich, sweet boozy flavor can be tasted throughout the entire sip. While this blend was a bit too sweet for my personal taste, I think it would be perfect paired with a sweet treat or by itself; or as a craft dessert cocktail on the rocks, similar to the White Russian that Second Cask experimented with for this blend. In fact, I think I will be trying this very drink this weekend. Currently, Second Cask has 12 -ounce bags of whole beans available at a reasonable price of $15.99. Four kinds of barrel-aged beans are available, and include Whipnose, Chocasmoke, Lagunitas High Westfield, and Fluxuate. There are plans to change both the packaging as well as the size of the bags to 8 ounces in the near future. The beans are available for purchase exclusively from the Seven Stills taproom, and the company will be shifting to kegs of cold brew available at beer bars around Northern California. There are also future plans to add whole beans for purchase online. In the meantime, Bay Area, California, readers, go grab your bags of beans from Seven Stills and also try out a glass of cold brew on tap at the following locations: Seven Stills, Beer Revolution in Oakland, and the Albany Draft House in Alameda. 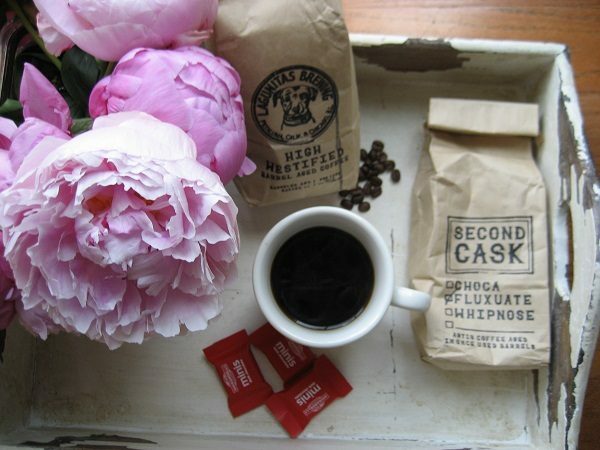 Win a bag of Fluxuate and Chocasmoke barrel aged coffee from @2ndcaskcoffee! To enter: 1) repost this pic, 2) tag @2ndcaskcoffee and @sweatpantsandcoffee, 3) use the hashtags #SPCgiveaway and #2ndcask. You must do ALL 3 STEPS in order for your entry to count. Good luck and check out our review now up on SweatpantsAndCoffee.com. Teri is a science administrator by day and writer by night. 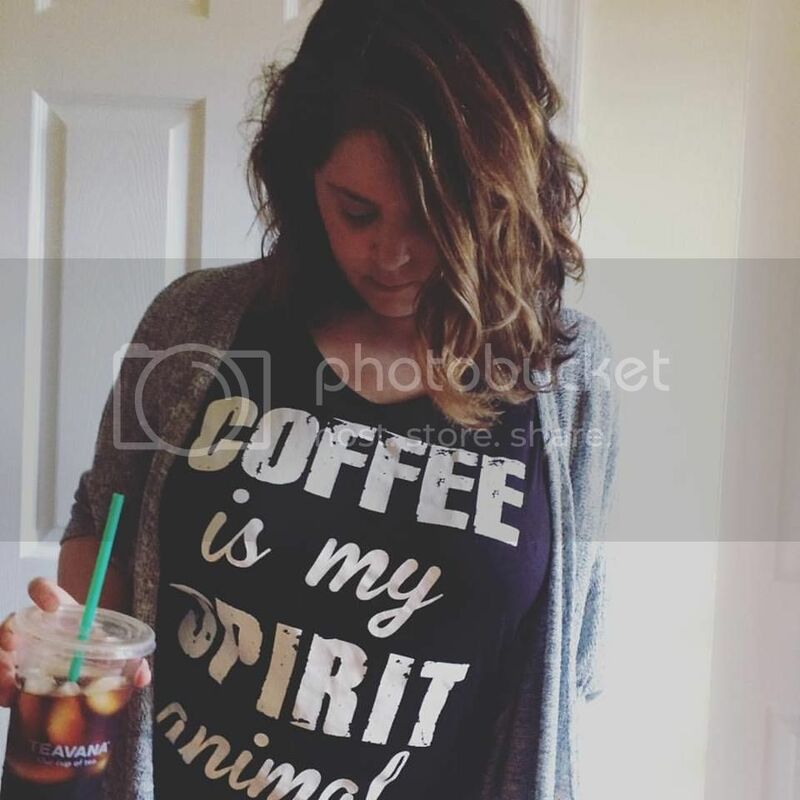 She loves coffee, books, shopping, Netflix marathons and fluffy blankets, and of course, her family.